We have now talked about Preparation, and now it's time to move on to the next stage in the game. Phase 2 - Deployment - is where the theoretical goes out the window and you know what you are using, and what the opponent has brought to the game. This is an absolutely crucial phase, as any play in initiative choice, objective selection, obstacle placement, and deployment can have ripple effects for the rest of the game. 2) Deployment - The other half of Turn 0. This is where you begin to set playing pieces on the board. If you have the higher bid, you will determine if you will take first or second player at this point. If you are first player, you will pick from your opponents objectives as well. You should enter this section with a game plan of how you want the eventual engagement to take place. It begins with setting up obstacles - we have some older articles on using these to your advantage - and continues with the deployment of your fleets. 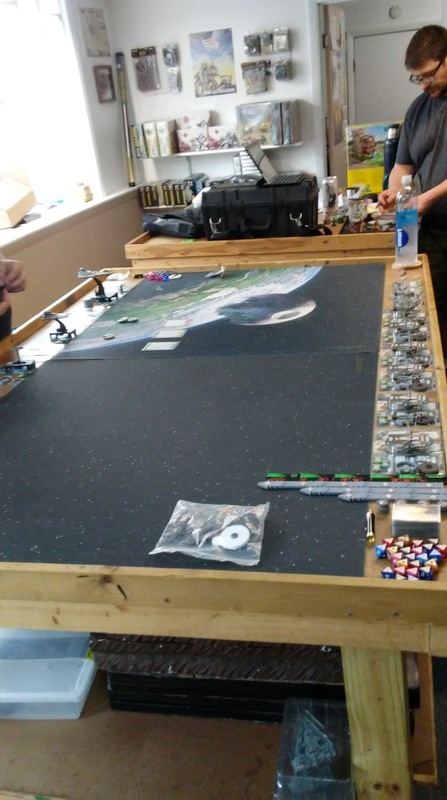 You should use the obstacles and your fleet deployment to dictate where and how the engagement will happen, and expect your opponent to do the same. 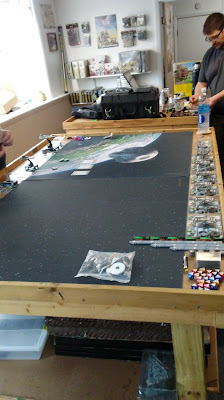 Once all ships are deployed and Turn 1's Command Phase is over, we move on to the next phase. I'm not spectacular at this part, full disclosure. When I design a list, it tends not to be one that demands First Player to use properly. I have seen a lot of different numbers thrown around for how much you should bid to win choice of player, and it seems to be an arms race for people bidding strictly for First Player. I have build fleets before that want Second Player, and for that somewhere around 5-9 points is entirely sufficient. If you do win the bid, however, you should be looking out at the enemy's fleet as they put it out. Hell, if you didn't win the bid, look at their fleet as well. If they have their list written out look at it, if they are not so kind to you, loop around to their side of the table and look hard at their ships, squadrons and upgrades. How many activations do they have? Can you afford to let them have first activation? How many deployments do they have? If you select First Player does this give them the final deployment? Do some simple math with their ships. What is each one worth? How does that stack up with your own ships? Which of your own ships can you trade to bring down the enemy's biggest prizes? What role does each ship fill in their fleet? Their squadrons? What will they try to do with them against you? Looking at their list, what do you think they would have brought as objective cards? Can you handle one of those objectives if you take First Player? Assuming you haven't built a list to go First Player all the time no matter what, you should have a game plan now to select First or Second Player. Now, assuming you have either selected First Player, or been handed it from someone, take a look at the objectives that just flipped up. Compare them to your fleet. Which one lets you mitigate the advantage Second Player is getting the most? 1) Will placement of obstacles benefit or hurt your ship's approach and engagement? Large base ships really don't want to fly through a tightly clustered obstacle field in order to engage the enemy, and it can greatly limit their maneuvering options. Small base ships can (usually) figure out a way to navigate a field, but may be forced to make a non-optimal approach because they can less afford to eat an asteroid to the face. 2) Will placement of the obstacles help or hurt your squadron engagement? Squadrons can utilize the obstacles to obstruct attacks, and avoid engagement. Got a cluster of bombers heading your way? Don't give them a place to hide! Worried about the enemy fighter screen tying up your own bomber force? Give them a few obstacles to leapfrog up through. Remember in this scenario, the bigger the obstacle the more things can hide on it. 3) What are the rules for the objective again? The objective may in fact greatly impact your deployment of obstacles, specifically if the obstacles being deployed can limit how the objective is played. Station Assault, Contested Outpost, and others are very dependent on where the other obstacles are placed. 4) Where do I want this fight to take place? The shape of the obstacles on the map will determine where the best place for your own ships and squadrons to engage will be. Use this time to think about your own deployment plan, especially if your deployment is predicated on formation flying, or your are at a significant deployment disadvantage. I remain of the opinion that one of the biggest and best advantages that you can have in the game is deployment advantage, being able to put down something important after the opponent has placed all of their ships. Being able to put something big and angry down after the rest of the fleet is on the table is an amazing advantage in outmaneuvering your opponent, especially if the ship in question is fast and hits like a ton of bricks. Not all fleets rely on deployment advantage, and there are ways to limit its effectiveness. One way is to have a fleet that deploys in formation. No need to worry about out deploying the enemy in this scenario - your ships will all wind up where they need to be regardless of if you have to deploy them all first, or all last. A lot of the infamous "2+3" Rieekan Ace lists use this strategy. Another strategy is to use Second Player objectives to give yourself a deployment advantage. Solar Corona, Superior Positions, and Hyperspace Assault are great ways to out deploy your opponent even if you don't have enough deployments to get a true advantage. By the time you enter the deployment phase, you should be generating in your mind how you want the game to go. You have seen their list, and you see the map's obstacles (and potentially objectives) and you should be able to identify where you want the engagement to take place. Try to start this phase with a guess on where the enemy will deploy their fleet, and deploy your own fleet to take advantage of this. Your goal here is to set up in a way that will minimize the amount of work your own ships need to get into position, so that you can either bank command tokens, or utilize "better" commands than Navigates once the Skirmish and Engagement phases begin. By the time this phase ends, you should be able to look at the map and have a pretty good idea where and when the Skirmish and Engagement phases will take place, and have a plan in place to maximize your own advantages when they do, then having a plan for how to disengage your ships (and squadrons) if everything goes your way. Theoretically, at this point, you want to be able to set all 6 command dials for each of your ships, assuming everything goes down the way you want it to. Now is also the time to look for traps your opponent has set for your own ships. Flankers, heavy hitters, obstructions to keep you away from their objectives or out of unfavorable arcs. Start thinking of how you can either escape or defuse those traps by careful maneuvering, or decide if you want to spring those traps with overwhelming local force.